One has to see such a place as Pompeii in person to appreciate what actually happened here. On entering the main gate, which was from the direction of the sea, you come up to the forum, which today is all cleaned up and looks fairly benign. Architecturally, it must have been a very impressive classical Roman city. It was in fact a Roman resort town for the wealthy elite. When you study drawings and reconstructions of what the buildings that made up this town once were it becomes even more impressive. However, as you proceed out toward the outskirts of the town to the east or the south you begin to run into the un-excavated areas of Pompeii. Here you will see how deep the entire town was buried and the destruction wrought by the rain of volcanic pumice and lava stones. Imagine the fear and panic of those simple people who had no idea what a volcanic eruption with its pyroclastic flows of hot sulphur dioxide could do to them. Inside the bath house just off of the forum they have several of the castings that were taken when the early archeologist found the hollows in the ash deposits formed when human bodies were buried after succumbing to the poison gas and ash fall. Vesuvius, always just over your shoulder, is beautiful but menacing when one thinks that it could happen again at any time. Many of the homes we visited, The House of the Faun, The House of the Vettii and The Villa of the Mysteries are all remarkably well preserved and I was impressed by the style in which these people lived. The spatial sequence of the homes is what impressed me. In most cases they are quite similar. One can look through the house from the front entry and see the entire sequence. The entry is a low dark narrow defensible space. Then the two story atrium with its great height, central pool (or impluvium) and skylight. It is often surround on the second floor by a balcony which enabled the residents of this floor to walk around and look down into the atrium. The stairway was often hidden which made the second floor even more remote and mysterious. When it rained the rainwater would funnel from the roofs on four sides of the skylight down into the space and cascade into the impluvium. Opposite the entry and across the atrium is the tablinum where business was transacted with the master of the house. Beyond the tablinum was the open air garden or peristyle, surrounded by a colonnade which supported the roofs of the porticos. One could walk around the peristyle under these porticos protected from the rain or the hot Italian sun. 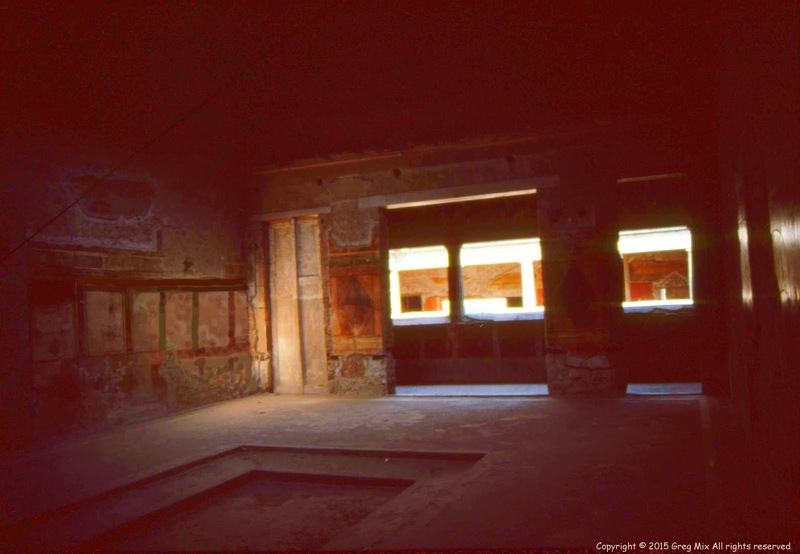 Often times, on the far side of the peristyle would be located the triclinium or dining room. People would lie on inclined benches around a central open area and be served food from slaves bearing trays or a table would be set up in this space. The walls in all of these spaces were decorated with frescoes depicting life in this part of the world intermixed with scenes from mythology. The entire house was enclosed by stone walls coated with cement stucco and therefore protected from whatever might be occurring in the ancient streets of Pompeii. After climbing three floors up in an old Roman guard tower on the east wall I was able to get these splendid views of the wall, the town and the volcano. View of the Walls of Pompeii from atop one of the guard towers. Vesuvius is beautiful but menacing when one thinks that it could happen again at any time. The devastation as seen from a tower on the wall. The bakery of Popidius with its four grindstones made from the local volcanic rock! The view looking across the Tablinum and Peristyles from the Atrium of the Villa of the Faun. A street in Pompeii, Note the crosswalk stepping stones which enable wagons and carts to pass through. The Peristyle or Garden of the House of the Vettii. Inside this villa were several excellent frescoes and wall decorations. I only wish I had better lighting a tripod with which to take good photos. One approaches the site from the modern town of Herculaneum sixty feet above the ancient town. As you walk down the path toward the sea you begin to realize that the site of the ancient Herculaneum is completely underground except for this small excavated section of the town. At the end of the ramp you turn onto a gangway that leads to an ancient street that begins at what was once the edge of the Mediterranean. As you can see many of the buildings are in a state of excellent preservation. Food service shops still have their counter tops built out of chunks of marble atop large storage jars that used to contain nuts, grains, bread and soups. Much of the wooden elements of the buildings are still in place. Some of the window shutters, exterior beams, wine racks and furniture that are still in place were charred by the hot gases of the pyroclastic flows from Mount Vesuvius. The interiors of typical roman homes here are well preserved. The first main room of a house we visited, the Atrium, is two stories high, complete with mosaic tile floors, a pool in the center of the room, Frescos on the walls and sliding cedar entry doors. The opening in the ceiling provided the space with light and ventilation but it also allowed rainwater to pour in and fill the pool, called an impluvium. When the pool filled up it then over flowed into a cistern which provided the family with a store of fresh water. Beyond this first main room is the Tablinum in which the owner conducted business, which looks out to an enclosed garden beyond know as a Peristyle. These Peristyles were usually surrounded by columns supporting porch roofs or Porticos. Traces of the gardens still remain and of course there was typically a decorative pool and fountain. Each of these homes was completely enclosed with solid stone walls and tile roofs. Some of these homes of the wealthy covered entire city blocks or Insula. This kept the household save from intruders. Once the front entry was sealed the house was safe from thieves or rioters in the street. Yet the home still enjoyed gardens, sunlight, flowing fountains, fresh air and blue skies. It was a clever design for urban living in an unstable world. At one point our tour guide showed us a bird bath supported by three carved seahorses. He instructed us to feel the detail in the mouth of one of the seahorses. The roman sculptors were so thorough that they included the shapes of the inside of the roof of sea horses mouths. If we ever get the chance we will go back and spend several days in Herculaneum and Pompeii. Food service counter in a fast food store. Food storage jar in the corner of what was once a house. Note the lead the pipes in front of the entry to this building! A typical street in Herculanium. View from the foyer through the Atrium. Note the uneven floor due to years of burial under 60 feet of volcanic deposits. Detail of the threshold of the front door. Sliding cedar doors, bench and opening in the roof. Again the Impluvium with its bench and an access opening to the cistern below. Detail of the tile floor. Another garden with a mosaic alter that once held Sculptures. Another view of the Forum where my wife leans on fountain with a trough. A Villa of a wealthy Roman over looking the sea, Note the bird bath supported with the three sea horses.